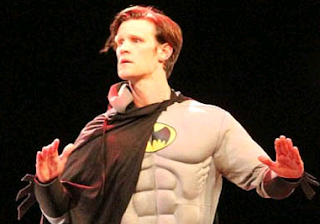 cryptonaut-in-exile: Matt Smith as Batman. Yes, Batman. Apparently, 'Doctor Who' star Matt Smith was one of several actors who participated in a recent event called '24 Hour Plays' in Los Angeles. For his part in the event, which tasks writers with scripting a play in one night and having actors perform it the next, Smith played a 'very confused Batman' who wakes up on an autopsy table.